Robert Kubica says he still has "a good chance" of returning to formula one. After his post-race test in Hungary, the Pole has now returned to the F1 paddock at Monza. Although not in Renault team gear, the 32-year-old is basing himself at the Renault motor home as he works throughout the weekend for the Italian broadcaster Sky. "Months ago, I promised someone I would be back in the paddock, either as a driver or for TV," Kubica said. "I prefer to be in the car but this is a good step forward with respect to what has happened. A few years ago I would not have imagined it." 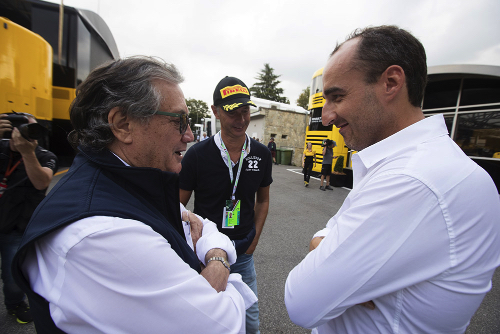 However, Renault boss Cyril Abiteboul said just a week ago at Spa that he isn't sure if Kubica is actually able to return to F1. "What happens next? Good question," said the Frenchman. There are rumours Renault will give Kubica his next chance to prove himself in the 2017 car in free practice ahead of the forthcoming Malaysian grand prix. "I would like to have another chance to drive," admitted Kubica. "You have to have your feet on the ground and your head free but the last months have been fundamental in lifting my doubts about being able to drive at a high level in formula one. "I don't know what will happen, but so far it was nice. I am not yet a driver because I do not race, but there are good chances," he added. "I'm convinced that I could do well and that I can drive these cars at a high level despite my limitations. At the same time I have learned that you have to enjoy what life gives you every day."